Do bugs love you? 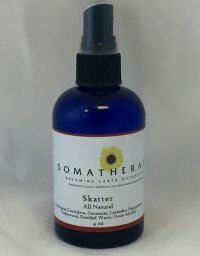 Try Skatter, an all-natural formulation made by us here at Dreaming Earth Botanicals using only our pure essential oils, a little grain alcohol (as a dispersant), organic soybean oil and distilled water. It's very effective, safe, gentle to the skin & smells nice too! Essential Oils of Eucalyptus Citriodora, Geranium, Lavender, Peppermint, Cedarwood Atlas and while insects may not like the smell, we do!